Measure and create working drawings from “as built” parts. This is an “as-built” radiator shroud that required measuring and drafting. 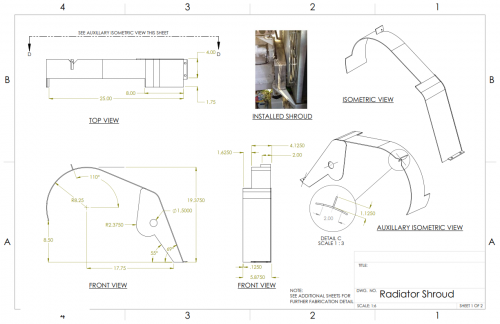 The rendering and the working drawing are produced in Solidworks. The shroud shown here is part of a larger project requiring the measuring and drawing of approximately 20 parts. Modeled radar masts, consoles and various parts, assemblies and sub-assemblies. Unable to show samples since the work was on classified Navy vessels. Design “Box Insert Assembly” to fit and function in exsiting larger assembly. 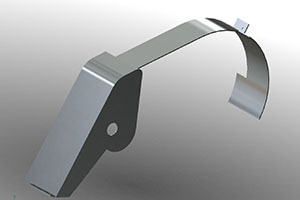 This sub-assembly is composed of 3 parts each modeled in Solidworks then assembled as a smaller assembly to be palced wihtin the larger assembly. The larger assembly is composed of approximatley 40 individual parts also contracted to design for this local fabricator. The larger completed assembly is not shown due to confidentialty.